anyone else expreince knee pain when rididng euc? but does anyone know what this is? or have you tried something similair? You may just need to do some leg exercises to strengthen the muscles. When I ride a long time I tend to get some soreness in my quadraceps and soles of my feet, but not in my knees. Well, until I blew out my knee recently, but that wasn't from riding a long time. I've been doing some exercises for rehab and noticed how tight even the uninjured leg is. Stretching and light strength exercises help with that. Do you ride with your knees bent a bit or locked straight up? The only that hurts me is my back. After 20 miles or so it gets tired of leaning forward. On my 14c my feet were the weak link. 16s it’s back. As a runner for me, knee pain equates to too much concentration of weight on the heels (compounded when you lock your legs). Might wanna try to distribute more weight balance onto the balls of your feet. Doing so for me when running made any knee impact go right away. I think you are in the correct position, so this does not explain the pain. Locking your knees would be bad. hows the knee pain holding up Shad0z? Nice te hear you have found a working solution ! If it hurts your knees, feet or back while ride your EUC, I have two very simple solutions to this problem. @Marty Backe said in one of his videos that many riders are pushing their legs very tight to the wheel when riding. He give a advise to try to be more relaxed and not keep your legs to tight to the wheel. This is a good advice because it reduces the pain in your legs. An another method is to go a few steps forward on the ground and look down on your feet and observe what position they are when you are standing naturally. Use the same position on the pedals as you do when standing normally on the ground. So if your toes point outwards when standing on the ground, they should do this on the pedals as well. If one of your foots is a bit further behind than the other one while standing on the ground, you should have the same position on the pedals as well. Try this and I think it will feels more comfortable to ride your wheel. Sounds awesome! Could you share the specific exercises that worked for you? This is good info. Thanks! Maybe it’s that the KS18L pedals seems smaller as I have a US 13 size foot. Hopefully they make bigger pedals soon. I've said this on the forums before, but if you've ever had to stay on your feet for multiple hours on end (shopping, car shows, theme parks, working as a store greeter, security guard, etc. ), you'll notice that, when staying stationary, you start shifting the majority of your weight intuitively back and forth between legs, to minimize pain. EUC is no different. The easiest way to implement this for EUC is to be constantly carving (constant leg-to-leg weight transfer). Remember, even going straight can be comprised of many small turns, ala skiing. In the beginning, newbie EUC riders tend to stay flat-footed, with paralleled/mirrored feet, only whole body turning, side-to-side, with no real offset shifting of weight from leg-to-leg. Not only is this an inferior way to turn (limited turning radius), but there is no significant weight compensation transfer happening to alleviate foot pain after/during long rides. The first step IMHO is to learn how to get your feet mobile (on-the-go) in order to adjust for the optimal position. The only way I've found to do this is to pivot the feet around in patterns of left-heel-up-AND-right-toe-up, then switch and repeat until each foot is in the desired positioning. This stance is a great way to easily start emphasizing this feeling of shift in weight balance, leg-to-leg. 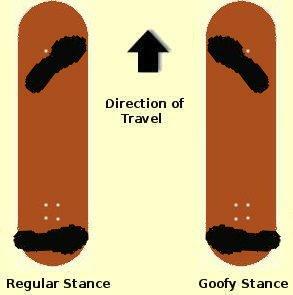 Here, we are somewhat imitating the way a skateboarder or snowboarder stands facing one side or the other on their board. One foot is slightly more towards the front of the respective pedal (toes can be hanging off the edge), while the other foot is slightly more towards the back of the respective pedal (heel can be hanging off the edge). Both feet and torso will face slightly to the left (Goofy position, left foot is more back) or right (standard position, right foot is more back). Both legs should be spread in a stable, diagonally-sitting A-shape, where, depending on body and wheel dimensions, the legs most likely will barely, if at all, touch the wheel side pads. Remember, even if the wheel dimensions change, your body does not; place your feet wide and stable according to your body physics, not those of the wheel, even if your feet hang a little off the pedals (within reason). Because the feet are split with legs in an open A-shape, this de-emphasizes placing equal weight in each feet where, obviously, the more front foot carries more weight when leaning and going forward, and the rear foot carries more weight when braking and going backwards. Braking / changes in speed can be quicker in this position as well, as you can instantly shift your weight to the other leg. In contrast, when your legs are relatively together / in the same place for the more common paralleled / mirrored 11's feet positioning, your pivot bases are limited to the shorter distance between heels and toes, so the change of weight equilibrium needs to involve the full movement of re-leaning your hips / torso and/or legs, which by itself is much slower. The only drawback to this positioning is that it favors one turn direction over the other, and creates a blind-side, ala skateboarding / snowboarding. I would also add to the knee pain discussion that sometimes moving to a larger Wheel will cause you more knee stress because it is heavier and has more centrifugal force keeping it in one place. When I first started riding the V10 and then the KS18s before that, my knees would get a little pain just below the meniscus. Sometimes to the sides as well. It always goes away and so far that I have been riding the heavy weights regularly, my knees haven’t been sore. I remember SpeedyFeet doing a video when he first started riding and mentioned the knee pain, and later mentioned it had gone away so it must have been muscle build up. Thats been my experience too. Sometimes on a long 5 hour ride my knees will feel a little sore at one point or another. Doing those shifting tactics mentioned by @houseofjob really helps out. I have run a few marathons and my knees will lock up right around 4 hours of runnng or 22 miles, whichever comes first, but that is definitely bad running style on my part. If it happens after long rides or because you are on a heavier machine, that is normal. You will build up the muscle and as long as you dont over stress your knees a number of days in a row in the beginning, you will be fine. Marvellous summary @houseofjob Thank you. I ride a staggered stance similar to below. Slightly more angled due to big feet / small pedals. However find there is significant foot overhang. It’s amazing just how important pedal size can be. This mini carving on straights seem innovative. Will certainly try this today. @Stan Onymous you’re correct. Moving from 16’ to 18’ has its differences. I’ve tried knee straps and supports because the meniscus has been painful. I also noticed last night my tire pressure was too high. Thus riding was rougher. I’ve since reduced it and it’s much softer. It’s also important to note when sliming your wheels the tire pressure may not be accurate 100% as I believe slime takes some unaccounted psi amount. I also﻿ noticed last night my tire pressure was too high. Thus riding was rougher. I’ve since reduced it and it’s much softer. This was the reason for my slight knee pain also. For me the tire pressure on an EUC is a precise balancing act between knee pain, uncomfortable ride, mileage, smooth rolling, and tight turning on asphalt. How do you figure that? It does take away a slight amount of air space in the tire, but it is just free flowing, non-pressurised liquid. Or do you mean that because of just that a Slimed tire will behave like a smaller tire, hence requiring more pressure for the same feel? This may be bro science. But having compared V8 and KS18L riding with pre slime and post slime. I’ve noticed differences in ride ability even when using the same psi. In my mind despite its free flowing nature slim still takes up some pressure space aka volume of tire. This was also tested after pumping slime around inner tube multiple times with the air valve off. I’ve noticed differences in ride ability even when using the same psi. I see, so it just basically acts like a smaller tire then, pressurewise? That does make sense, I just would’ve thought the difference to be too small to be notable. I didn’t notice it on my 16x2.5 and 18x3.0 tires. Saying that the psi becomes ”unaccurate” or that the slime ”takes” psi, sounded a bit... less scientific to me. Being new to EUC:s I have now been riding for 2 weeks. Pain in my left knee when riding. The cause is my left foot has a bit of a collapsed arch making it want to roll inward. So a corrective soles or a more outward turned stance will probably fix this. This is on a Ninebot E+ which has relatively flat pedals. My wife gets similar pain when riding on her electric longboard and that is also because of the way she places her rear foot on the board. I feel that knee as well, but mainly the muscles that are activated , the following is for me the case : Vastus Medialis .. The lovely teardrop muscle that we all want to develop. The vastus muscles work together to extend the leg and also stabilize the knee. The vastus medialis works hardest at the last 15% of extension. So for instance if you were to train leg extensions on a machine with short range to extension then you would work the medialis harder. Since we are bending the knees a bit when riding EUC we are in that short extension range. So now the question is... do we train less or do we train more? I would say train more and become stronger but also ride intelligently so that we don't ride too much or too long when our muscles are fatigued. thats the problem i had, but my arches are almost non existent... so it hurt a lot, now it doesnt hurt, but im left with a cracrkling sound in my knee that can turn into a problem if untreated, and my doctor just told me to loose 5kg... im not that overweight, should be possible, but still, there should be something else i could do?